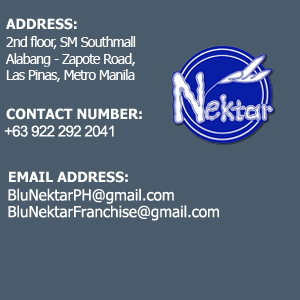 Blu Nektar is a local company based in Nagcarlan, Laguna, Philippines established in 2012. It opened its first branch in the Nagcarlan Public Market back in September of 2012. It has since expanded to additional branches in Sunstar Mall in Sta. Cruz, Laguna, SM City Santa Rosa, SM Southmall, SM City Manila, and SM City North EDSA. Plans of further expansion will be done through franchising. Blu Nektar is not about keeping up with the trends but in creating classic products that will stand the test of time. Blu Nektar is dedicated to developing drinks that adhere to the uniqueness of our brand. Our drinks stand apart from the rest that with one sip, you will be able to tell it apart from all others. Through the years, the company has gone from a simple roadside stall to three branches and now expanding throughout the country. It is through this growth that you can tell that there is a growing market looking for a special concoction that is reminiscent of one’s favorite cake. We specialize in making shakes that come from your favorite cakes. Blu Nektar’s founder is Homer Alvarez. Formerly an employee in international cruise ships, he was exposed to several food trends and products all around the world. He has taken this exposure and combined it with his natural curiosity in developing drinks to the next level. It is his passion and his dedication to creating unique beverages that led to the foundation of Blu Nektar. His training with the international luxury liner company expanded his knowledge in customer relations, customer satisfaction, marketing, sales and product development, skills which have all been crucial in developing and expanding the business.